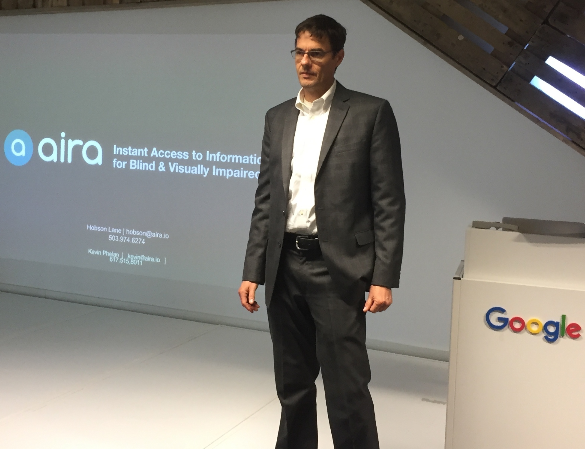 Hobson presenting Aira at Google’s European Disabilities Forum. We are pleased to announce that Hobson Lane, Data Scientist and expert in Autonomous Systems, has joined Aira as Head of Artificial Intelligence. Hobson has 20 years of experience building autonomous systems that contribute to the common good. He brings to Aira not only his talent for building systems that exceed the state of the art, but also his enthusiasm for building a new breed of AI systems that benefit Aira’s blind and visually impaired Explorers. The holder of six patents, Hobson earned his M.S. degree in Dynamics and Controls from Georgia Institute of Technology, and his B.S. in Physics and English from Vanderbilt University. He is the author of technical papers and is a prolific lecturer in autonomous systems and machine learning, as well as the lead author of Natural Language Processing in Action, the definitive book on prosocial dialog systems. As Head of Artificial Intelligence, he will employ AI to increase the ability of our Explorers to achieve greater independence by accessing information and assistance instantly — when and where they want it — via Aira’s remote agents. AI will increase Explorers’ freedom and mobility in such game-changing experiences as gaining rewarding, long-term employment or academic achievements, navigating the nation’s busiest airports with self-confidence, experiencing the beauty of parks and museums, and traveling the globe. AI will also enable Aira to increase the availability of its services to more people in the blind and visually impaired (BVI) community by helping to increase system efficiency and reduce administrative costs, thereby enhancing the affordability of these services to the BVI across all socioeconomic spectrums. 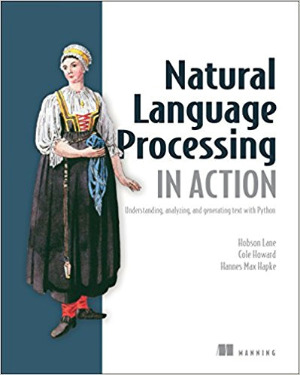 Cover page of the book, Natural Language Processing in Action. Moreover, Hobson’s work will allow us to take advantage of recent exponential advancements in object detection and natural language understanding (NLU) to greatly enhance the human potential of our Explorers, including giving them “super powers” of perception and memory that heretofore were not possible. “Hobson brings a perfect blend of AI skills that bridge the gap between industry-leading AI platforms and Aira’s powerful context, which — derived from our Explorers and our ‘human-in-the-loop’ approach to delivering instant information access about the physical and digital world — represents a powerful combination for the context-based AI that we are rolling out,” said Suman Kanuganti, CEO of Aira, with excitement and enthusiasm. At Aira, we have the opportunity to combine object detection and natural language understanding (NLU) technology to dramatically enhance our Explorers’ capabilities, such as their power of perception and memory — greatly enhancing not only their user experiences, but also self-potential and empowerment. For instance, Aira Explorers will soon be able to see beneath the surface of objects and people in our world, enriching all our lives with their unique perspective. As a society, we are focused on commerce. And, we’ve optimized our machines to focus primarily on business outcomes, or the bottom line. As a result, our machines end up manipulating society to the benefit of business rather than contributing to the common good. Aira surprised me with their focus on truly helping humanity by assisting their Explorers — the blind and visually impaired. Building machines that are focused on the common good may be one way to ensure that humanity and society survive the coming AI revolution. Those of us lucky enough to have the means and education suited to build autonomous, intelligent machines, have a unique responsibility to ensure that those machines learn to value and support human life. Our reward will be richer lives, leading to a smarter, more inclusive society. Aira is AI + AR for the blind. We combine the power of Artificial Intelligence and Augmented Reality with wearable technologies, plus the interaction of our network of trained remote human assistants, to provide the 300 million blind and low vision people around the globe immediate access to information and assistance. Our technology not only greatly enhances independence and mobility for those with vision loss, but also forms the basis of our future endeavor to create smart cities that are accessible for all.